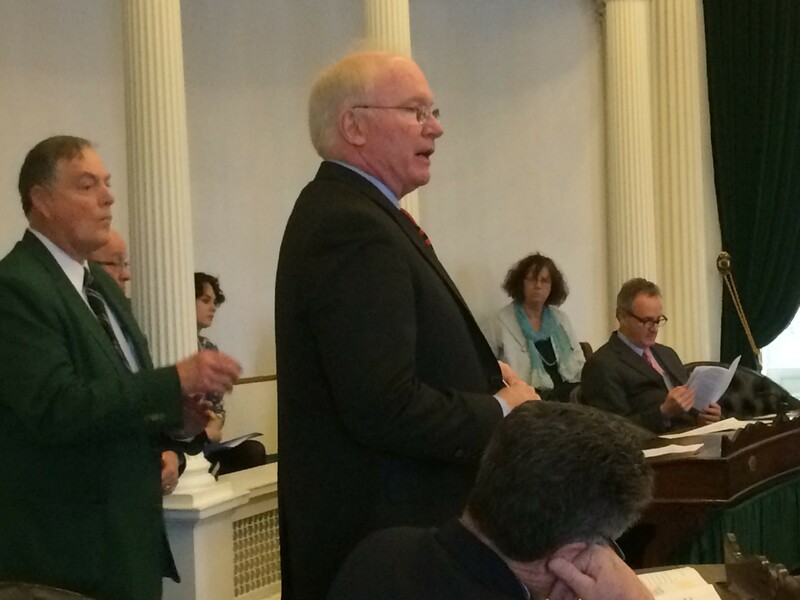 Sen. Kevin Mullin (R-Rutland) defends paid leave bill. Despite concerns about the potential effect that a paid sick leave bill might have on small businesses, the Senate gave preliminary approval to a bill likely to grant the benefit to 60,000 Vermonters. The House has already passed a paid sick leave bill, and Gov. Peter Shumlin has indicated his support. The Senate is expected to debate amendments Wednesday and then take its final vote. Sen. Kevin Mullin (R-Rutland), chairman of the Senate Economic Development Committee, which unanimously recommended the bill, defended the mandate that would affect all employers. Most of the Vermont workers who are without paid sick leave work for small businesses, he said. “There are some businesses that are going to struggle with this,” Mullin acknowledged. He suggested that the benefits — reduced employer turnover, reduced spread of illnesses and greater productivity — should offset the financial cost of providing the leave. The bill would be phased in with employees limited to a maximum of 24 hours of sick time during 2017 and 2018. Subsequently, they would be able to build up a total of five days of sick leave to use in a year. Employees could use their sick time to recover or receive treatment for injuries and illnesses, to care for ill family members and to go to medical appointments. Employees could also use the time for counseling and to arrange social and legal services associated with domestic violence. A business could require newly hired employees to wait a year to be able to take paid sick leave. The bill doesn’t extend paid sick leave to employees who are less than 18 years old or to temporary and seasonal employees who work 20 weeks or fewer a year. It also gives a new business a year before it would have to offer paid sick leave. Mullin noted that if employers already offer paid time off, they would meet the requirements of the proposed law if they allowed someone to use that time when ill.
Campion questioned why the bill exempted the ski industry. Many ski resorts employ workers for fewer than 20 weeks a year. Campion suggested many of those part-time employees work in food services. If one of the goals of the bill is eliminating the potential for contagious illnesses to spread through workplaces and to customers, why exempt this group? Campion asked. Mullin presented estimates of the potential cost to the state and private sector. During the two-year period when the maximum amount of available time is three days, the state’s cost to provide sick leave to some of its employees would be about $60,000 a year. When the allowed amount of leave jumps to five days, the state’s burden would be $70,000. The collective cost for private employees would be $2.8 million to $6.3 million in 2018, and $4.8 million to $11 million when the workers would be eligible for five days of sick leave. Dan Barlow of Vermont Businesses for Social Responsibility argued that the bill balanced workers' and employers’ needs. “It supplies workers with the necessary time they need and gives employers flexibility." The House is awaiting the final version of the Senate bill before deciding whether to go along with the revisions or demand negotiations. “What we have seen so far is not causing huge concerns,” said Rep. Sarah Copeland-Hanzas (D-Orange), Democratic House leader. The Senate version has increased restrictions on those who would be eligible for sick leave, which could trigger negotiations, she said.